High-performance aircraft which left their mark on history are brought back to life online. In service from October 25, 1951 to October 24, 1952. 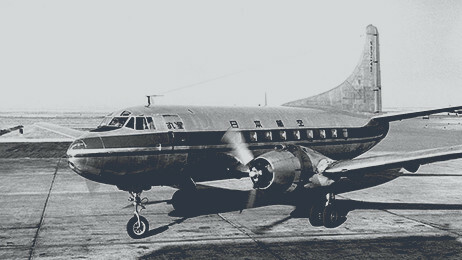 In service for only three days, starting on August 27, 1951. This DC-3 was used for invitation flights ahead of the beginning of scheduled flight services in October. The aircraft was leased from Philippine Airlines and operated under the name, "Kinsei." The photo was taken prior to departing Haneda Airport for the first invitation flight around Tokyo on August 27. Put in service from October 25, 1951 and retires from service on October 24, 1952. JAL leased a total of five aircraft from Northwest Airlines. This aircraft faded from sight when JAL began independent flight operations a year later. The aircraft seated 36 passengers and had a cruising speed of 450km/h. Put in service from November 2, 1951 and retires from service on March 19, 1965. Approximately one year before beginning independent flight operations, JAL operated this aircraft leased from Northwest Airlines under the name, "Tenousei." JAL purchased the same aircraft after the company began independent flight operations, naming it "Tokachi." Put in service from March 24, 1953 and retires from service on April 26, 1969. 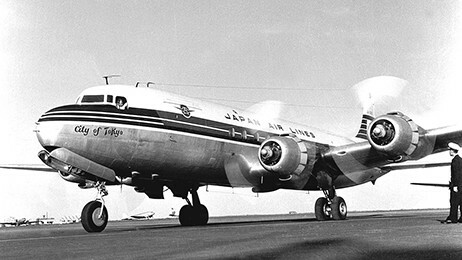 Introduced for the start of scheduled international service (Tokyo - San Francisco) on February 2, 1954. 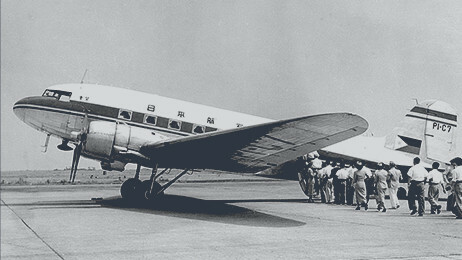 JAL's 10 DC-6B aircraft (including one leased aircraft) formed the backbone of its international fleet during the 1950s. The aircraft seated 36-58 passengers (on international flights) and had a cruising speed of 450km/h. Put in service from December 17, 1957 and retires from service on December 9, 1965. 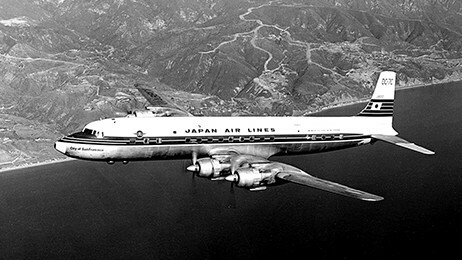 JAL owned five DC-7C aircraft in the transition preceding the introduction of jet aircraft. 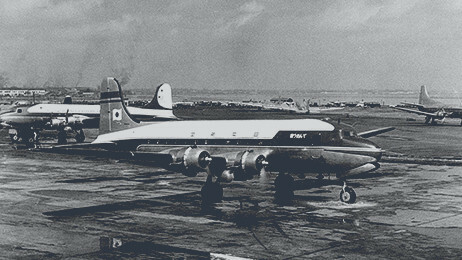 The DC-7C was an innovative aircraft that used turbo-compound engines to achieve higher speeds and a longer range. The aircraft seated 48-72 (international flights) passengers and had a cruising speed of 550km/h.